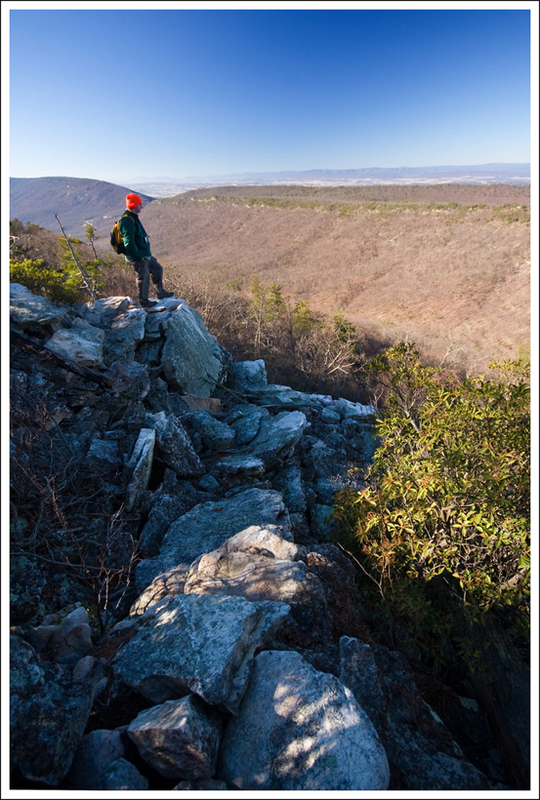 The Strickler Knob hike is a beautiful, 5.5 mile hike in the Lee Ranger District of George Washington National Forest. 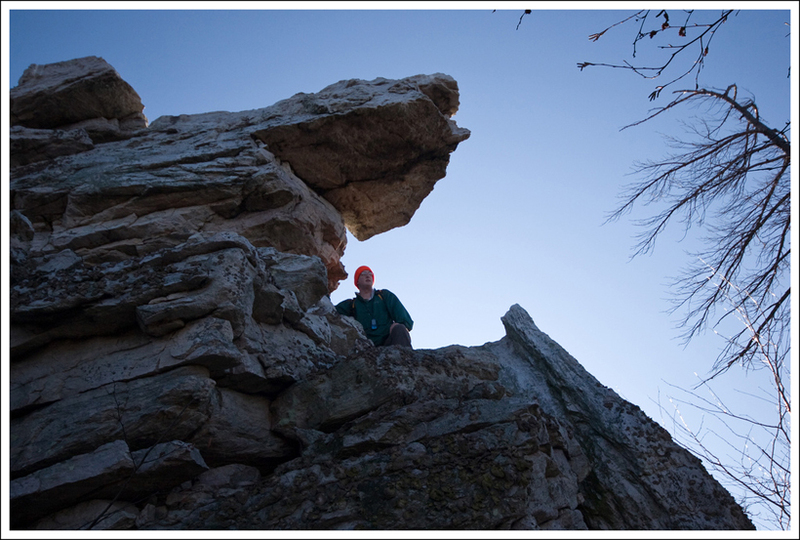 It offers fabulous views of the Page Valley and a short, but fun, rock scramble. The view of New Market Gap from Strickler Knob is amazing! Below: Park at Scothorn Gap; Adam crossing Passage Creek; Trail markers. This is a great hike that is still not very well known. There are some great views at the top and a mini rock scramble that is good preparation for anyone who wants a little practice before tackling Old Rag. I wouldn’t recommend this hike for small children or dogs due to the rock scramble. The hike can be a little tricky to navigate, so I have provided some clear directions for following the trail. After parking at Scothorn Gap, you’ll immediately wade or rock hop across Passage Creek. The hike starts off on a fire road. The way starts to get fairly steep at .4 miles, but levels off again at .65 miles. At .8 miles, the hike gets steep again, but levels at .95 miles. This is the hardest part of the hike, so once that is done, the elevation changes are small. At 1.07 miles, you will see a nice campsite for anyone that wants to stay overnight. At this point, you will see an arrow pointing to the right, where you will pick up the trail again. The trail continues SSE from the campsite and you will be leaving the fire road for a hike through the woods. At 1.3 miles, you will come to a junction sign. Head straight on to the orange-blazed Massanutten trail. At 1.94 miles you will come to the junction with the Strickler Knob trail to the right. This trail was built and opened in 2006 by some anonymous trailblazers. 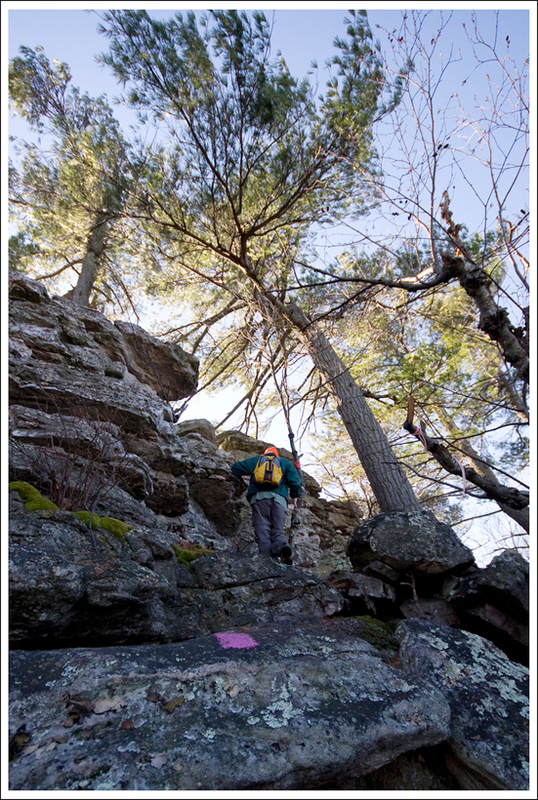 The blazes for this trail are marked as pink on rocks and typically red or purple rectangles on trees. This trail is fairly rocky, so be careful not to turn your ankles. Around 2.5 miles, you will see gorgeous views of the Shenandoah River and the Blue Ridge Mountains to the east. 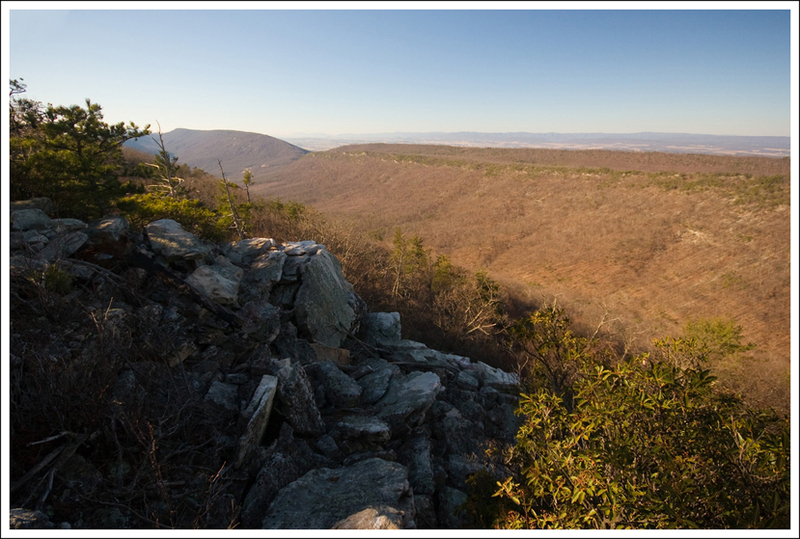 To the west, you will see more of the Shenandoah valley and the Appalachian Mountains. 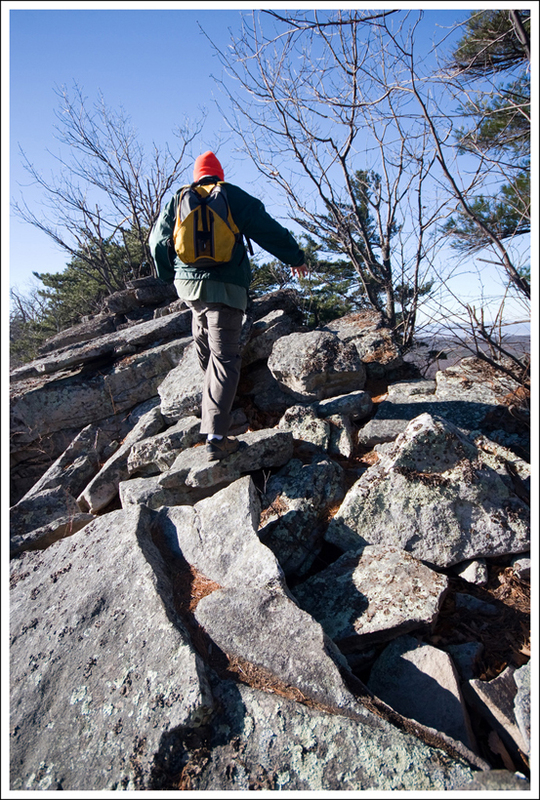 At 2.67 miles, you will reach a rock scramble for about one tenth of a mile until you reach the summit. This is a great spot to have 360 degree views of the area around you. 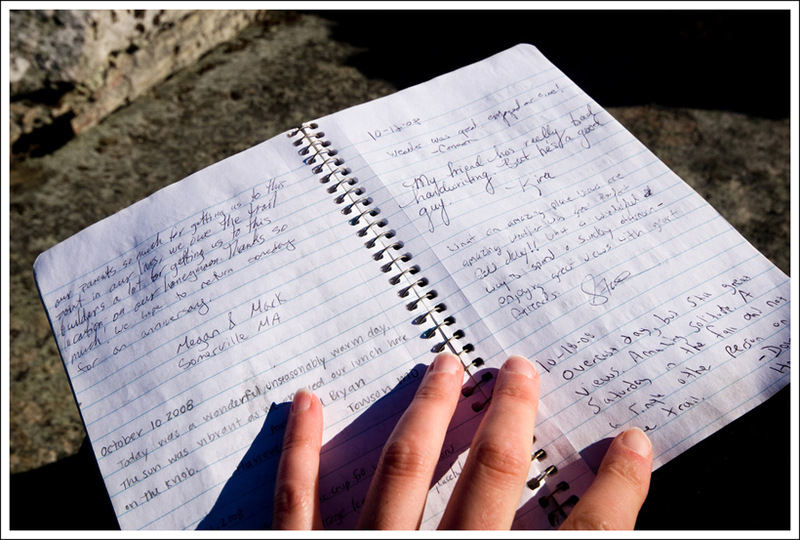 Tied to a tree, you will also see a logbook that someone placed for people to journal about their hike. It’s definitely a good read to those that are interested. 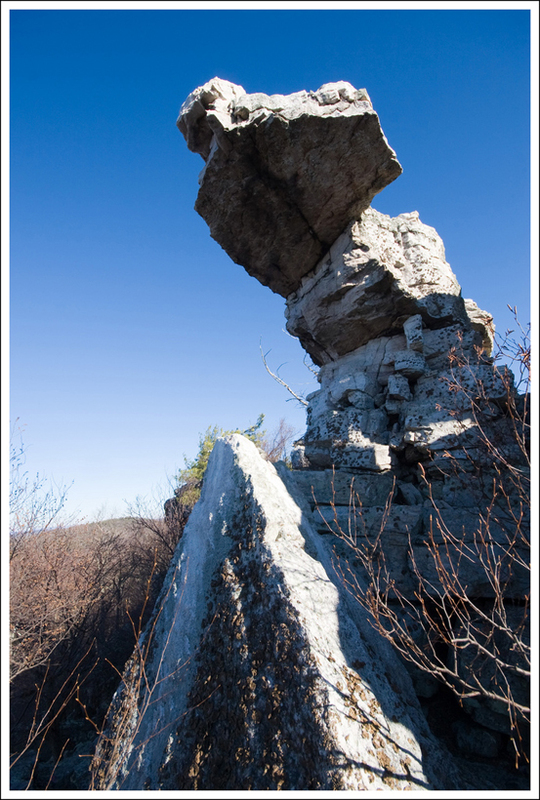 The hike to Strickler Knob has lots of interesting rock formations to scramble over! Below: One of the more interesting formations; Adam walks the mountain’s spine; Scrambling up the pinkish-purple blazed Strickler Trail; More rock formations. We hiked the Strickler Knob trail on the recommendation of a friend of mine from Flickr. He said it was a fun hike with excellent views. He wasn’t kidding! We walked the trail on a bitter, windy winter day shortly before the forest road closed for the season. The section of road that leads to the trailhead is periodically closed in the winter to prevent damage to the road surface. (You can always check the status of roads and trails in the George Washington National Forest on their website) The hike was fairly easy and passed through the beautiful woods of Massanutten Mountain. 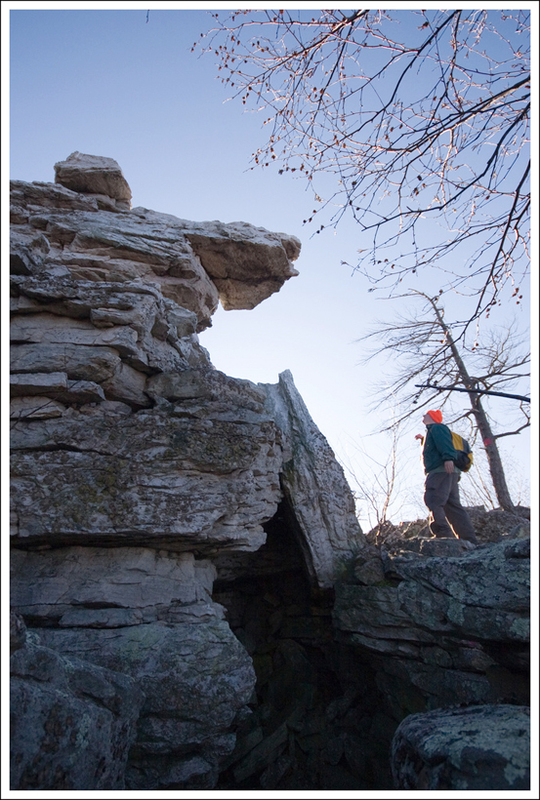 The Strickler Knob trail branches off the main trail and follows a rocky ridgeline over to the knob. I love scrambling on rocks, so the last portion of the trail was my favorite part. When we reached the knob, the view was amazing. We got there mid-day, so it wasn’t a great time for photography. I’d like to hike it again in the afternoon sometime. I think the late day light would be prettier on the rocks and over the valley below. While Adam hid his geocache, I spent some time reading the trail journal at the summit. It was entertaining, and I even came across the name of an old co-worker in the book. I also remember it being super windy at the summit. It was so bad, my bag of trailmix blew over and (sadly) sent chocolate covered peanuts spilling all over the rocks. I hate it when I lose chocolate like that. I’m sure some stupid crow enjoyed it though. Difficulty – 3. There is some moderate climbing along the route. The scramble might be tough/scary for some. Trail Conditions – 3. Most of the trail is nicely graded and well maintained. 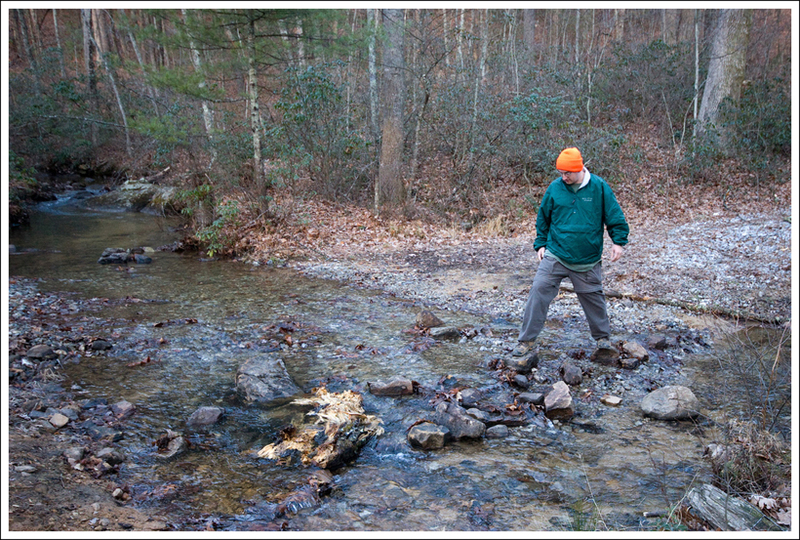 But once you turn onto the Strickler Knob trail it’s rocky and requires some scrambling. Views – 4. Once you reach the top you have some great views. Waterfalls/streams – 1. Just a small stream to cross at the beginning. Wildlife – 2. Hunters like this area, so there must be wildlife (although we didn’t see any.) During hunting season, make sure you’re wearing bright colors and making noise. A co-worker who was running up here also got attacked by a wild goat here. Ease to Navigate – 3. The blazes can be a little tricky to follow on the pink blazed Strickler Knob trail. Otherwise, the trail is pretty straightforward. Solitude – 2. Since 2009, this trail has become increasingly popular. We revised the solitude rating from 4.5 down to 2 in 2014. Reach the trailhead by turning on to Crisman Hollow Road (FD 274) off of 211 near Luray. 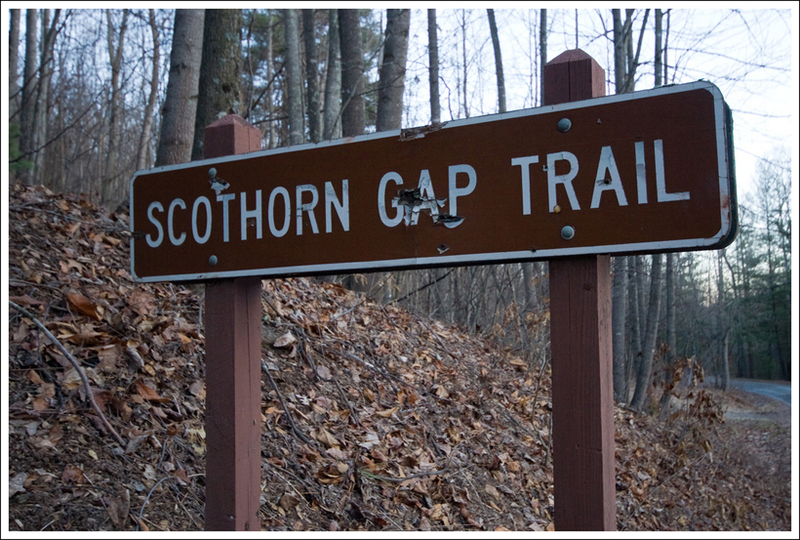 Continue on this road for a few miles and park at the Scothorn Gap trail parking. Once you have parked follow Orange Blazes on Scothorn Gap trail. Follow trail directions above. Love yall’s website! We did Strickler’s Knob on Saturday and were surprised by the abnormal amount of bees and flies at the summit. It didn’t ruin the view or anything like that, but there was a constant buzzing and getting hit in the face by large bugs. Loved the hike though! Thanks for the visit! Too bad about the flies and bees. I wonder what drew so many to the summit. I went out to hime Strickler’s Knob yesterday (Nov 17th 2013). The hike was gorgeous, and I had a blast on the rock scramble. I will definitely do it again. I wanted to give you a couple of tips on navigating the trail, however, as we weren’t the only ones to get lost. Firstly, when you reach the campsite at 1.07mi turn right and follow where the orange arrow is pointing. 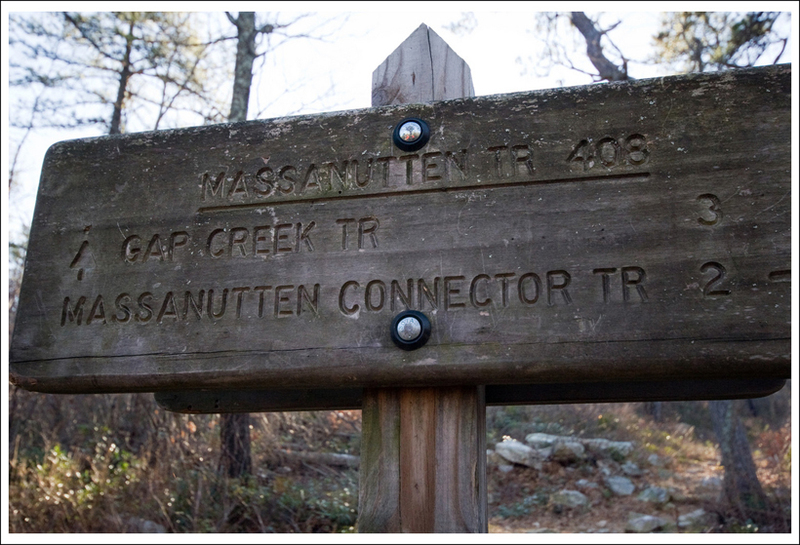 Secondly, when you reach the junction sign at 1.3mi which says Massanauten Connector Trail -> and for the Gap Trail go straight, go straight! Thirdly, It appears the junction sign at mile 1.94 has been removed. There is missing bark on a tree where the junction should be which is probably where the sign used to be. Finding the turn for Strickler’s Knob is a bit difficult. Along the trail, at mile 1.95 you will find yourself at the highest altitude possible on the current trail. To your left will be a small hill which you can easily climb to overlook the below city. To your right will be a few rocks and a lot of trees. Straight ahead, you will see almost a small valley through which your trail continues. I say valley because there will be a small hill to your left (described earlier) and a small hill to your right. You walk in between them. Do not head straight. The current trail continues on a loooong downhill journey which starts off with a sharp right turn and eventually cuts you back to the left and continues on for what seemed like miles. If you stand in the “valley” i spoke of and turn around and slowly start walking 30 paces or so towards the car . . . to your left, between your nine and eleven o’ clock, you will notice what looks to be a red suction cup about 10 feet off the ground, stuck to a tree. This marks the beginning of the route to Strickler’s Knob. Going towards it, you will find yourself going over a small rock scramble with the occassional rock marked with a purple rectangle. This is the route to Strickler’s Knob. The rest of the path is pretty well marked from here. I hope this post can save someone a little bit of time and energy and help them stay on track. Havn’t done the Strickler Knob hike yet, but soon. Thanks for the info……. Thanks for the geocache! It was a pleasant surprise, and the journal entries were fun to read. Thanks for the visit! We’ve been meaning to go out and re-hike Strickler to check out the condition of our cache. Thanks for the correction, John. I fixed the directions. 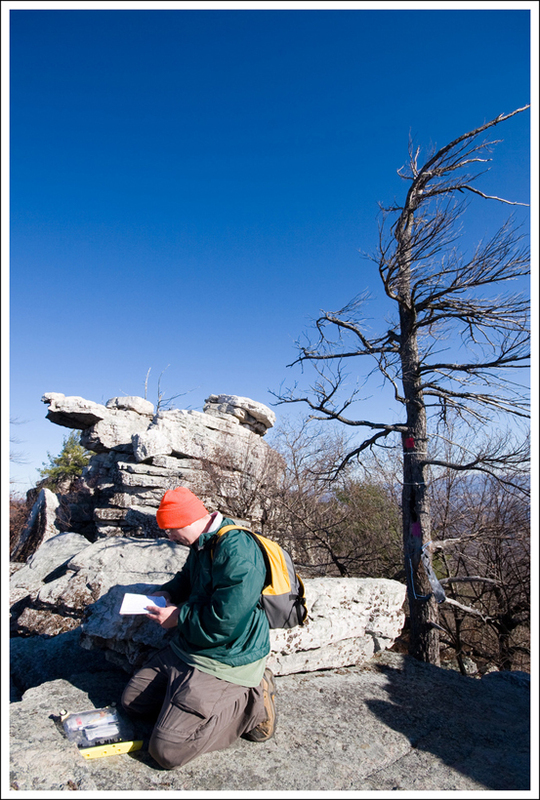 Trails in that section of GWNF can be challenging to ID on the maps – signage out there is not as thorough as it is in Shenandoah. I don’t think the trail to Strickler Knob is even marked on PATC’s most recent map of that area. Thanks Joe! I’ll make some notes on the trail description to key people into it. One of my co-workers missed finding the pinkish markers at the top and just headed back down. Of course, she didn’t have a GPS or had written down any of our notes on the hike. I’m glad you found the geocache I placed up there also. This is such a great hike and I felt it needed to have a geocache there. Since then, hikingupward has put one there also. We were actually nearby on the same day doing Duncan Knob. We should have our post up for that in a few days, but it’s another one of those gems that has a great rock scramble at the top. If you liked Strickler Knob, you’ll like that one also. Did this hike yesterday looking for the geocaches that are on the knob and right at the begining of the trail to the knob. All I can say is WOW!!! What an amazing hike and amazingly good time. It was a tad cold and windy yesterday, but it was an amazing day for hiking and what a view it was from the knob!! This is by far my favorite hike so far. Thank you so much for your review and way points…without those my group would have been totally lost. I will for sure be using this site again for all my trail hiking adventures, because you guys have super accurate information and your journaled trips are spot on with great advise. Thanks also for hiding the geocache on the knob, it was my 200th find!! One suggestion, make sure for people wanting to hike Strickler knob that they put in the waypoint for the start of the knob trail after the trail junction or pay very close attention, because the trail is not very well marked at the begining after you reach the top. Once you pick up the first pinkish/brownish marker on the rocks your totally fine and cant miss the rest of them, but I found it hard to see the first one from the road without a good bit of looking. Thanks again and hope to do some more fun hikes and read all about where you guys have been.